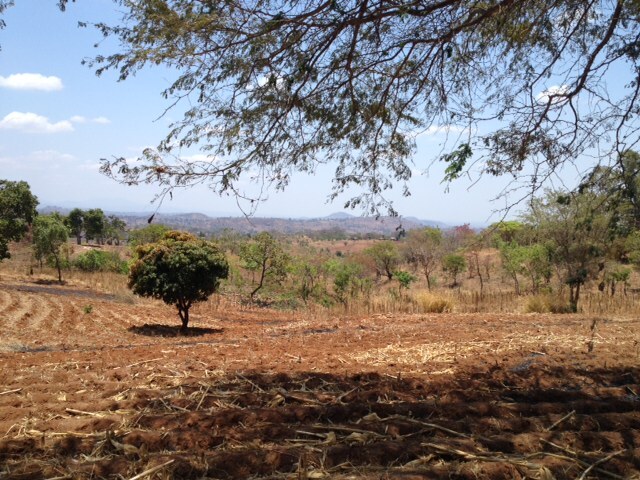 Nearly a year ago, the New York Times ran a devastating story about the deforestation crisis in Malawi and its impact on residents of Lilongwe, Malawi’s capital city. Illegal cutting of nearby forests was causing water shortages and disrupting the city’s hydroelectric power supply, forcing the government to deploy soldiers to protect the forests. The root of this problem was Malawi’s dependence on wood for meeting energy needs―more specifically, charcoal. Nearly 97 percent of Malawian households depend on wood or charcoal for cooking or heating. Even in urban areas, 54 percent of households use charcoal (a product of wood) for cooking. But there are only so many trees. Malawi is one of the poorest countries in Africa, where electricity is an uncommon luxury and subsistence farming is the norm. With seemingly few options and climate change adding uncertainty, the situation depicted in the New York Times article seemed hopeless. But Malawi’s government has confronted the deforestation crisis boldly, and has taken several critical steps towards a solution. In November 2015, it was one of the first countries to join the Africa-wide restoration initiative called AFR100; in September 2016, as part of this initiative, it formally committed to begin restoration on 4.5 million hectares (11 million acres) of deforested and degraded land by 2030. Both actions support the regional and global restoration goals of AFR100 (to bring 100 million hectares of deforested and degraded land in Africa into restoration by 2030) and the Bonn Challenge (to bring 350 million hectares globally into restoration by 2030). And last week, Malawi released two important strategies that outline how it will get there―the National Forest Landscape Restoration Strategy and the National Charcoal Strategy 2017-2027. 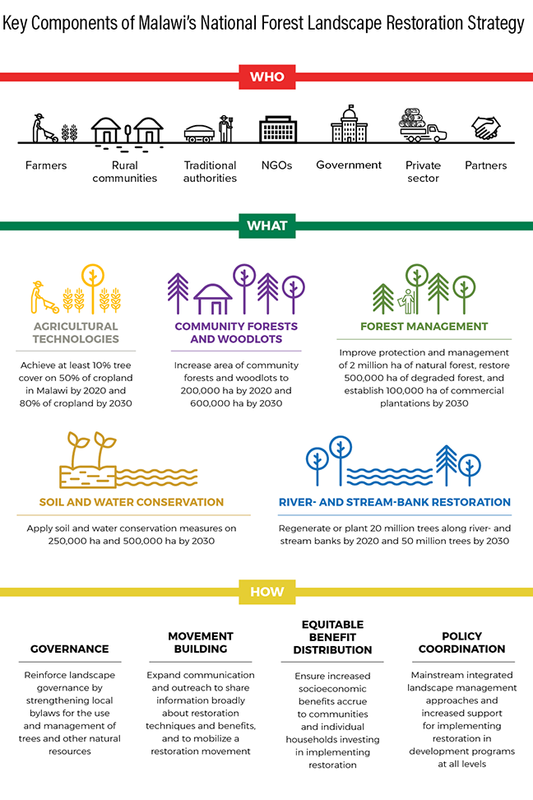 The Forest Landscape Restoration Strategy lays out specific restoration activities and sets clear targets to achieve its 4.5-million-hectare goal. The activities are not unfamiliar, complex or expensive, but rather were chosen through a consultative process because they have already been successfully implemented on a small scale in Malawi. They just need effort, investment and encouragement to be scaled up more widely. Agricultural technologies. The most common type of improved and “climate smart” agricultural technology is farmer-managed natural regeneration, where farmers protect and maintain trees on their croplands to improve soil fertility and crop yields, with the added benefit of providing a local source of fuelwood. Because this activity does not require acquiring and planting seedlings, it is one of the most cost-effective and least labor-intensive forms of sustainable land management. Community forests and woodlots. Village forest areas and homestead woodlots provide a locally managed and sustainable source of fuelwood for communities and individuals, so that they do not have to deplete forest reserves or venture far from their homes to access their energy supply. Forest management. Maintaining existing forest reserves and expanding other forested catchment areas through increased support for participatory forest management are a critical solution for maintaining a healthy watershed. Soil and water conservation. Communities can protect slopes from high water flow and erosion by constructing check dams, infiltration ditches and other types of infrastructure that can prevent major damage from flooding and protecting croplands from gully formation and crop loss during heavy rains. River- and stream-bank restoration. Planting and regenerating trees along water courses is critical for protecting Malawi’s water and hydroelectric power supplies from being ravaged by erosion and siltation, particularly near major population centers like Lilongwe and Blantyre. Malawi’s National Forest Landscape Restoration Strategy and National Charcoal Strategy represent a huge step forward in articulating the drivers of the problems and the range of solutions available. And they are unique for several reasons. First, they provide specific, actionable targets for curbing deforestation and restoring trees to the landscape by addressing both supply and demand. Second, they affirm the importance of cross-sectoral engagement. They acknowledge that deforestation is not just a problem for the Department of Forestry to solve, but requires the concerted effort of almost every sector, including agriculture, water, electricity, finance, rural development, industry and infrastructure. Lastly, both strategies provide a menu of options for achieving their goals and acknowledge that no single solution exists. Rather, success will be achieved through the culmination of many solutions, with participation at every scale―from rural communities to the highest levels of government. As the first country in the AFR100 partnership to develop and formally adopt a comprehensive strategy to protect and restore its forests, Malawi has demonstrated real resolve in overcoming what had been seen as insurmountable problems and challenges. Now, the focus can shift to implementing the solutions. With that, the nation is poised to become a leader for Africa, and the world, in solving its deforestation and land degradation crises.